Last updated on May 18, 2018 . 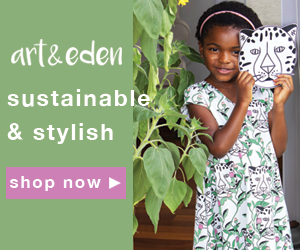 Today I’m introducing a newer brand in children’s clothing: art & eden. They’re a playful, fun brand with a serious mission: socially conscious children’s apparel. I’ll talk about stylistic aspects of art & eden first (as much as we love the planet and want to make a difference, we want to know what the styles are all about, right?!) then I’ll move on to what they’re doing with the environment. And finally, we’ll get to hear from Susan Correa, CEO of art & eden, with some inside details. How does art & eden come up with their designs? art & eden commissions artists from all around the world to create exciting and upbeat prints for their clothing. This is different to what most other brands do, and I think we can expect to see continuous originality from their clothing as a result. Who will enjoy art & eden? From a purely stylistic point of view, those who like OshKosh B’Gosh or the now-closed Gymboree or Naartjie styles will also enjoy art & eden, because of the high-quality look in playful styles. As parents, it will also appeal to those who want the peace of mind that the textiles they use are free of pesticides and use low impact dyes. While clothing does not go inside our systems the way food does, it still comes in contact with our skin all day long, so having clothing that is free of pesticides is definitely a good thing. From a socially conscious point of view, art & eden will appeal to those who would like to make positive changes to the planet. The price point of art & eden is reasonable for organic, sustainable, fair-trade clothing – however, I want to be up-front that compared to standard budget stores who do not offer those benefits, the art & eden pricing is higher than those budget brands. So this is something of which to be aware when shopping. However, if you’re looking to buy something unique and exciting – especially if you like to discover new brands, then you may feel the price is worthwhile for that. Likewise if environmentally conscious clothing is important to you, that’s something that comes included with this price. Let’s move on and find out exactly what art & eden is doing to make a difference. Fair wage and fair business practices – they partner with sustainable clothing factories that pay their workers a fair wage. Internationally recognized organic certifications – art & eden’s clothing has two certification marks: the GOTS (Global Organic Textile Standard) and the Organic Blended Content Standard. This way you can be assured their clothing is truly organic. Their girl’s collection is made of organic cotton; the boy’s collection is made of organic cotton, or organic content mixed with recycled or upcycled polyester. Low impact dyes – they make sure the dyes used on your child’s clothing is not going to harm them or the environment. They support talented artists worldwide by commissioning the art & eden designs from these artists. They contribute to the Clothes for Cure initiative, where each art & eden garment that is sold helps nourish a child in need. They mentor personally with a school (Camden Street School) to make a difference in these children’s lives. These are all things which have positive long-term impacts as well as immediate impacts. As an example of what you’ll help put into play when you buy at art & eden, let’s take a quick look at just the organic cotton and the low-impact dyes, together. I was shocked to find out that the regular (non-organic) clothing industry is the second most polluting industry in the world. This is due to the fact that 25% of the global insecticide usage goes to cotton production, and that 8000+ synthetic chemicals are used to turn raw materials to textiles. Now let’s look at what happens when you buy at art & eden – not only is the clothing better for your children right here and now, but also, it’s actively decreasing the use of harmful chemicals in cotton-growing and textile production areas of the world to help our planet. We are part of building a business where profit has so much bigger a purpose. Its not just gross and net – it’s holistic and all encompassing and its so wonderful to be part of a business that truly cares about people and our planet. Would you like to meet the people who make the art & eden clothing? Here you can find out more about the people who work at the factories which make these clothes and learn what their daily lives are like. We are super fired up about an incredibly meangingful collaboration with a major U.S brand that will be in market Feb 1 2019. Our team is working diligently on this really awesome partnership. That’s exciting and intriguing news, and this wraps up our article. You can check out art & eden to see all their styles. Stay ahead of the curve: Subscribe to our newsletter and get sale alerts & kids fashion info! Hi! I'm Vera. If you're like me, you probably like to save money on your children's clothes. I was pleasantly surprised to find out that certain children's stores (but by no means all of them!) can often actually be cheaper than the 'big box' stores. I thought it might be fun to share these shopping tips with you on this site.